The programme for the 17th Time of The Writer: International Festival of Writers has been announced. The week-long showcase, which takes place from 17-22 March at the University of KwaZulu-Natal Elizabeth Sneddon Theatre, is set to provoke, inform and inspire, abd brings some of the world’s finest novelists, authors and storytellers to Durban, from as far afield as India, Kenya, Nigeria, Botswana, Togo, and Guinea. 20 writers will be gathering for a week of literary dialogue, exchange of ideas and stimulating discussion under the theme Freeing Our Imagination, in solidarity with Kenyan writer Binyavanga Wainaina’s clarion call for Africans to use their creativity to imagine and create a continent free of the existential burdens of colonialism. Prof Mzamane passed away on 15 February, having made his mark through writing and scholarship including The Children of Soweto, Children of Paradise, The Children of the Diaspora and Other Stories of Exile and Where There is No Vision the People Will Perish: Reflections on the African Renaissance. The first panel discussion of the festival on Tuesday, 18 March will focus on writing from the sub-continent, featuring Indian authors Satyagit Sarna and Prajwal Parajuly. Sarna is an author and lawyer based in New Delhi. His debut novel Angels Share, described as a love story, a political commentary, and coming-of-age novel, was published in 2012 by Harper Collins. He will be joined by Parajuly, whose books The Gurkha’s Daughter: Stories and Land Where I Flee have been lauded in international press. This panel discussion will be facilitated by author, Shubnum Khan. The second panel of the evening features South African writers Angela Makhlowa and Praba Moodley. Returning to Time of the Writer after her debut in 2007, Makhlowa is an author and public relations consultant. She became the first black female crime author with her debut novel Red Ink. She has since published a drama novel, The 30th Candle, and will be releasing her third later this year. Moodley published her first novel, The Heart Knows No Colour, in 2003, which was followed by two more novels, A Scent So Sweet (2006) and Follow Your Heart, the sequel to her debut. Her writing has been featured in publications such as Elle and Oprah Magazine. The panel discussion will be facilitated by author Shafinaaz Hassim. Wednesday’, 19 March, kicks off with a panel discussion featuring Professors Adam Habib and Paulus Zulu. As one of the country’s most recognisable political analysts and vice chancellor and principal of the University of the Witwatersrand, Habib has long been considered one of South Africa’s most astute experts in the areas of transformation, democracy and development. He holds qualifications in Political Science from the University of Natal and Wits. He earned his masters and doctoral qualifications from the Graduate Center of the City University of New York. His latest work is South Africa’s Suspended Revolution. Zulu is author and director of Human Sciences Research Council. A noted writer, academic and community leader, Zulu holds a PhD from the University of KwaZulu-Natal and has published extensively in the fields of politics and sociology both nationally and internationally. His latest book is entitled A Nation In Crisis: An Appeal for Morality. The discussion will be facilitated by Ben Fogel. The second panel discussion of the night will look trends in Francophone literature with a discussion by authors Sami Tchak (Togo) and Tierno Monénembo (Guinea). Tchak studied philosophy before obtaining his PhD at the Sorbonne University in 1993. He won the Grand Prix of Black African Literature for his entire body of work in 2004. He has published Femme infidèle (1988), Place des Fêtes, (2001), Hermina (2003), La fête des masques, (2004), Le paradis des chiots, (2006) and Filles de Mexico (2008). Monénembo was born in Guinea but lived in exile in Côte d’Ivoire and Senegal before settling in France and Cuba. He has published nine novels and a stage play since 1983. He won the 2008 Prix Renaudot, a French award given to the author of an outstanding original novel, for The King of Kahel. The panel discussion will be facilitated by Dr Bernard de Meyer of the UKZN French department and is presented in partnership with the French Institute of South Africa. Thursday night’s activities open with the panel discussion looking at key historical moments shaping the current South African political landscape. The panel will take the form of an in-depth interview featuring activist, researcher and political economist Professor Patrick Bond. Bond is an academic whose research draws from work with NGOs in urban communities as well as global justice movements in several countries. He is currently the director of the Centre for Civil Society at UKZN and is involved in research on economic justice, geopolitics, climate, energy and water. The discussion will be facilitated by Xolani Benedict Dube. Time of The Writer has a strong history of spotlighting young talented writers dealing with contemporary topics. The festival aims to create an even greater focus on stories from the younger generation and this is highlighted in the second panel of the night. Chronicling The Contemporary African Story brings together two South African authors, Kgebetli Moele and Niq Mhlongo. Moele’s debut novel, Room 207, was published in 2006 by Kwela Books and was shortlisted for the Commonwealth Writer’s Prize for Best First Book (Africa) in 2007. It was the joint-winner of the Herman Charles Bosman Prize for English fiction as well as joint-winner of the University of Johannesburg Prize for Creative Writing in the debut category. His second novel, The Book of the Dead, received the South African Literary Award in 2010. He released his third novel, Untitled, in 2013. Mhlongo is a Soweto-born journalist and author who has presented his work at key African cultural events, including the Caine Prize Workshop, and was a 2008 International Writing Program fellow at the University of Iowa. His debut novel Dog Eat Dog, released in 2004, has been translated into Spanish. He has since published two more novels, After Tears (2007) and the highly praised Way Back Home in 2013. The panel discussion will be facilitated by Duduzile Mabaso. Understanding the rich history that storytelling carries on the continent, The Time of The Writer festival is excited to present a storytelling programme, in collaboration with the Gcinamasiko Arts & Heritage Trust, taking place on Friday, 21 March. The event will feature Nomsa Mdlalose and Mshai Mwangola in a panel discussion looking at the art of storytelling. Mdlalose, who holds a Master’s Degree in Storytelling from East Tennessee State University, has years of experience in the artform and is the managing director of Kwesukela Storytelling Academy. Through her work at the Academy, she promotes the ancestral oral tradition as a heritage of sophistication, wisdom and philosophy. Nairobi native Mwangola is talented performance scholar, storyteller, and oraturist. She has performed, conducted performance workshops, researched and worked with and for diverse performance ensembles and individuals across four continents in a career spanning over 25 years. She is the chairperson of the Governing Council of the Kenya Cultural Centre. The panel will be facilitated by Dr Gcina Mhlophe. The second panel of the night will focus on youth literature, featuring Lauri Kubuitsile (Botswana) and Khulekani Magubane (South Africa). Kubuitsile is a writer living in Botswana who has published three children’s books, two detective novellas and three collections of short stories for children, co-written with two other Motswana writers. She has published three romance novels with Sapphire Press, Kwaito Love, Can He Be The One?, and Mr Not Quite Good Enough. Kubuitsile was the 2007 winner of the BTA/ Anglo Platinum Short Story Contest and the recipient of the Botswana Ministry of Youth and Culture’s Orange Botswerere Award for Creative Writing in the same year. In 2009 she won the USA’s Baobab Literary Prize in the junior category and in 2010 in the senior category. She was on the shortlist for the 2011 Caine Prize. Magubane is a journalist and author. At the age of 23 he has published more than 18 books. Although he is a children’s author his work deals with important issues such as class, race and religion. Saneliswe Ntuli will facilitate the panel discussion. In addition, Time of The Writer and the Gcinamasiko Arts & Heritage Trust will host a special matinee for children, to be held at the UKZN Elizabeth Sneddon Theatre on Saturday, 22 March, from 2.00 PM to 4.30 PM. The matinee will feature Mdlalose and Mwangola, who will be joined by Gogo MaBhengu and Lwazi Thwala. The final day of the festival features a discussion focused on the stories and work being produced by young female writers from Africa. On the panel are prolific authors Hawa Jande Golakai (Liberia) and Chibundu Onuzo (Nigeria). Born in Liberia, Golaka moved around extensively with her family due to political and economic unrest. She has lived in Togo, Ghana and Zimbabwe, before arriving in Cape Town as a student in 2003. She trained and worked as a medical researcher in immunology, and her first novel, The Lazarus Effect, is a gripping fictional drama set in Cape Town. Onuzo is a young author whose debut novel The Spider’s King Daughter has received critical acclaim. She has been shortlisted for this year’s Commonwealth Book Prize and was shortlisted for the 2012 Dylan Thomas Prize, as well as longlisted for the Desmond Elliott Prize in the same year. The panel discussion will be facilitated by writer Sandile Ngidi. This discussion features Sarah Britten and Zukiswa Wanner. Britten is a former journalist, artist and author from Johannesburg. She has been published extensively, wrote her Master’s research report on South African humour (with a focus on Madam & Eve) and has a doctorate in Applied English Language Studies. She has published three novels focusing on the colourful and unique art of South African insults, The Art of the South African Insult, McBride of Frankenmanto: The Return of the South African Insult, and More South African Insults. Wanner is a journalist, author and blogger whose work includes The Madams: A Wildly Provocative Novel (2007), Behind Every Successful Man (2008) and Men of the South (2010). 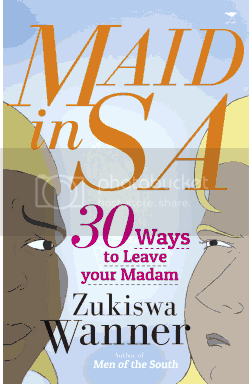 Her latest work is Maid in SA: 30 Ways to Leave Your Madam (2013). She is a founding member of ReadSA, an initiative encouraging South Africans to read local books. The panel discussion will be facilitated by writer and radio personality Ndumiso Ngcobo. In addition to the nightly panel discussions at the Elizabeth Sneddon Theatre, the festival’s Community Outreach Programme features a broad range of activities during the day, including seminars and workshops aiming to promote a culture of reading, writing and creative expression. The festival will also conduct visits to schools, and present a prison writing programme. Book launches take place at the Elizabeth Sneddon Theatre’s Wellington Tavern deck prior to the evening shows, from 6:45 PM. The 17th Time of the Writer Festival supported by the City of Durban, the French Institute of South Africa, and the KwaZulu-Natal Department of Arts and Culture. It is organised by the Centre for Creative Arts, which is housed in the College of Humanities at the University of KwaZulu-Natal and is a special project of the deputy vice chancellor, Professor Cheryl Potgieter.